Here at Wormald Burrows Partnership Ltd we pride ourselves in Quality and Innovation. Employing sound engineering principles within a Quality Assured practice we find innovative solutions which save you money, making your projects more profitable. 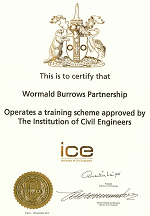 Wormald Burrows Partnership Ltd has always operated under a scheme of quality procedures, and since 1994 the practice has been certificated to ISO 9001 Quality Assurance. We use our in-house-developed TimeBytes system to record all our daily work, eliminating the need for inaccurate timesheets. Our system provides us with a complete history of every action carried out for our projects, resulting in reliability, accountability and a first rate product for you. Wormald Burrows Partnership Ltd believes in maximising the potential of staff and engineers by encouraging and sponsoring further education and attainment of qualifications. We run an ICE approved training programme. Health and Safety is of paramount importance at all times. Wormald Burrows Partnership Ltd holds SSIP (Safety Schemes in Procurement) certification from both SMAS (Safety Management Advisory Service) and CQMS.